Is my electrical equipment still safe? All electrical equipment in hospitals must be regularly tested. The UNIMET® safety testers offer standard-compliant measurement technology in a compact design. 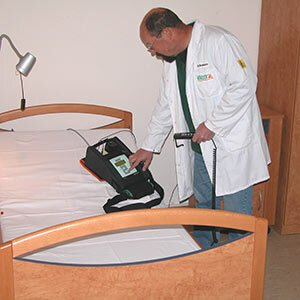 It is simple to use making testing hospital beds, treatment chairs and examination equipment simple and safe. Manufacturers of medical equipment and service providers are, according to the standards, obliged to save the “first measured value” in production. This serves as the reference value for later repeat tests. Bender safety testers meet these requirements and also enable customer-oriented adaptation of all tests.